They that sow in tears shall reap in joy.He that goeth forth and weepeth, bearing precious seed, shall doubtless come again with rejoicing, bringing his sheaves with him. Why settle for happiness when you can have joy? Joy is a richer crop than happiness. No one is exempt from suffering, but not everyone knows how to use those tears as seed. If you are going to endure a thing, out last a season, rise above a circumstance, then you would be crazy to overlook a harvest or a reward for not giving up. Galatians 6:9 reminds us that we will reap if we don’t faint. Harvest is not automatic. Just because you have a season of tears or suffering doesn’t necessarily mean you get a harvest. Harvest must be contended for. It’s an intentional use of your seed. Seed must be put into the soil. God doesn’t waste anything and we shouldn’t either. Instead of growing bitter, angry, and introverted, put those tear-seeds into the ground. You do that by prayer, praise, and faith that something greater is coming. God’s mathematics and divine manifestation has to do with multiplication. This is where you count it all joy. Joy is like the checkbook of your life. When the enemy or life itself brings you to the places of pain, you seed those into your account. Sowing in tears is setting you up for God’s supernatural harvest. 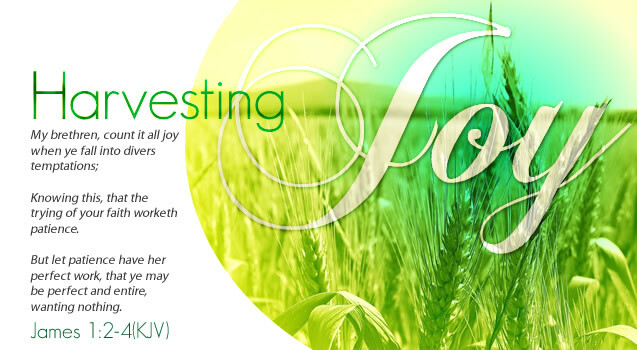 After you have outlasted that season…it’s time to harvest joy.